Today, piloting in restricted waters has become a highly specialized job aided by modern technology. Gadgets, instruments and software tools are always in the process of evolving as newer advancements in the navigation aids and technology take place. Gone are the days when one had to anchor during mist, fog or blizzards when visibility comes down to almost zero. Also, gone are the days when one had to take a position fix taking into consideration the external reference points across the navigating channels and plotting lines using a bearing indicator. The point of intersection of the lines on the chart used to give the position of the vessel. The point of intersection was called fix. Today, GPS, or a space assisted “Global Positioning System” has taken over and has virtually become indispensable for any sort of aerial, land or marine navigation. Moreover, new advanced control systems, which offer higher accuracy and integrity to the GPS, are always in the process of development to bolster the existing positioning system. 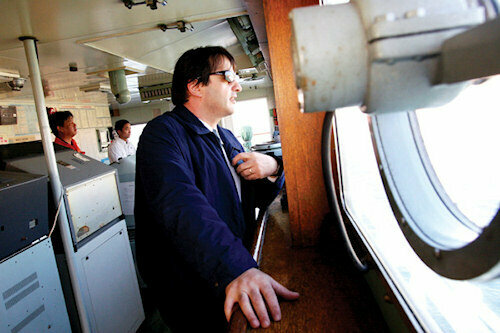 Every ship today uses several navigational equipment tools for utmost safety. Previously navigators used to depend solely upon nautical charts, which were actually plotted on papers and were the official database of the government authorized hydrographic departments. Those charts used to give a two dimensional view of the sea or river bed and its topography to assist safe navigation. Charts also indicate navigational hazards, sudden elevations on the sea bed, wrecks that block the navigation channel in restricted water, any kind of local man-made structures, position of the bridges, ports, structures on shore, position of the guiding buoys, turrets, obelisks and other shore references. These charts were prepared by the hydrographic departments and were updated after certain gaps, which made navigation vulnerable to sudden changes on the sea bed of the channel. Physical charts also used huge space block in the chart room on the bridge where charts were placed. To avoid this Electronic Nautical Charts were developed to move on from the paper to the digital variety. There are two main types of ENCs, the raster chart and the vector chart. While the first is merely a scanned variety of the earlier paper navigational charts discussed, the second is more data oriented. Though they are hidden, the data at a particular position are instantly given when sought for (with a click of the mouse or pressing a button). This disclosure is achieved when the ENC is customized by the navigational software, like ECDIS or Electronic chart Display Information System. All the electronic nautical charts conform to the guidelines of International Hydrographic Organization. Moreover, these charts are regularly updated according to the resolution adopted by the IMO which invited governments of member countries to conduct hydrographic surveys and publish and disseminate nautical information for safe navigation. The member governments should coordinate amongst themselves, wherever necessary, to timely update the information and ensure greatest possible uniformity in the published charts. Numerous chart plotting software also exist in the market which can be quite handy for navigation. One such is SEA CLARE, which is pc based software for windows 2000 and above. When connected to GPS, it shows current position, speed and heading of the vessel in real time. New charts can be fed automatically in text file and tracks can be saved for later viewing. Entries can be manually updated and entered. Numerous waypoints can be created to assist navigation. The GPS transmission capability must however be of a bit modern version called NMEA 0183 (which is a specification or protocol developed by The National Marine Electronic Association, Maryland, USA). Other bridge instruments which conform to this protocol can be connected to have various data on the screen along with the chart. Data like depth of water below keel, wind direction, ship’s heading from gyro, and even AIS can be connected to locate nearing vessel movements. A simpler version called PC PLOTTER is generally used by smaller crafts for yachting, fishing, and is fitted with a low cost Dual Channel Parallel AIS Receiver which can receive signals from large and small ships. AIS is the vessel tracking system to locate other ships in the vicinity by automatically exchanging data with nearby ships and AIS base stations. Local VTMS (Vessel Traffic Management Systems) /VTS (Vessel Traffic Service) is offered by ports where traffic is pretty busy but here the AIS acts as an additional supporting instrument. More details about AIS can be found here. 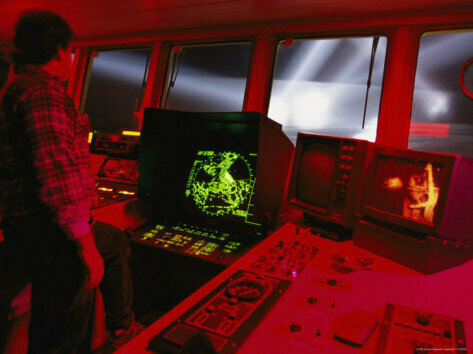 Another instrument that reduces the work load of the officer on watch and pilots is the marine RADAR fitted with ARPA. Radar, as we all know is a Radio Detection and ranging device that is capable of reflecting electromagnetic wave. Ships, aircrafts, buildings, motor vehicles, marshy lands, water body, low lying cloud chunks all reflect radio waves and hence are visible on the screen. The ARPA can calculate the speed of the tracked vessel, its course and forecast the closest point of approach. Relative speed between the vessel and a static point like a land mass can be calculated, and collision point and time indicated. Modern integrated ARPA has replaced the initial stand-alone with better end result for the captain and his staff. Maris, a Norwegian company, has another chart system based on ECDIS called Pilot Mate, which integrates with the bridge gadgets quickly. Here real time update for available drafts is received over email and so is tidal information, display of real color guiding ENC buoys, update history management etc. Route planning and monitoring are added advantages of this system. Thus we see that chart work with dividers, set-squares, sextant, and other tools have given way to a more digital environment on the bridge, thus almost eliminating the chances of human error. A truly digitally integrated system on the bridge virtually eliminates the chances of being aground or getting completely lost at the sea.